As a dietary supplement, take one half dropper of Salidrosol sublingual solution twice daily (.5ml). Store in a cool and dry place. Keep away from direct sunlight and heat. Do Not Refrigerate. DO NOT CONSUME MORE THAN 2ML PER DAY. Consumption of more than suggested may lead to hospitalization or death. Always consult with a qualified physician before taking any new dietary supplements. Keep out of reach of children. Do not take this or any other supplement if under the age of 18, pregnant or nursing a baby, or if you have any known or suspected medical conditions, and/or taking prescription drug(s) or OTC medication(s). What is Salidrosol Sublingual Solution? Salidrosol sublingual solution contains 10mg of Tyrosol and 10mg of Salidroside. What is a Graduated Dropper? All of Natrium Health's solutions and sublinguals include a graduated dropper. 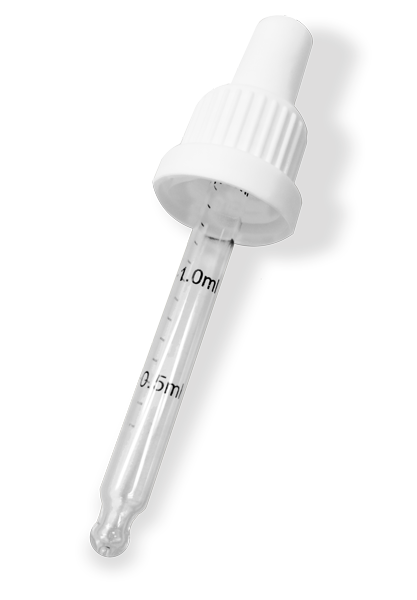 A graduated dropper contains legible markings on the dropper that tell you the amount of mL you are taking. This makes dosing with your Natrium Health solution or sublingual easy and convenient. See the image below for reference. To gain more insight, read the Salidrosol Solution reviews below. Where to Buy Salidrosol Sublingual Solution? Attention: These statements have not been evaluated by the Food and Drug Administration. This product is not intended to diagnose, treat, cure or prevent any disease.